Lecture recording has been shown to have many benefits for both students and lecturers. See the case for lecture recording. 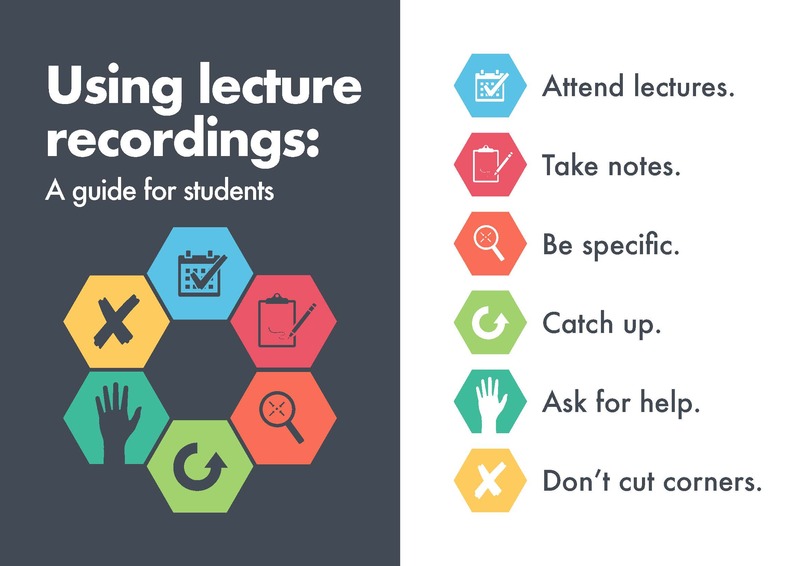 To make the most of lecture recording for learning, students and lecturers can refer to effective strategies and recommendations, such as those below. See the online infographic here, and consider incorporating the slide version into the first lecture for your class. Nordmann et al. (2018) have also found that using lecture recording should be context dependent, rather than an all-or-nothing approach. The full study with further recommendations is available online. For further student resources, the University of York have put together a set of student guides and study workflows - see "How York students use Replay". If you've found other useful guides for lecture recording, please feel free to share them with help@vula.uct.ac.za.